While the ultimate survivor of DC's 52 is battled out between books like Batman and Justice League, sooner or later someone's always got to be voted out at tribal council. IN: WORLDS’ FINEST Writer: Paul Levitz / Alternating artists: George Perez and Kevin Maguire. The Earth Two Huntress and Power Girl struggle to find their way back home, from ours. MY THOUGHTS: Swapping duo for duo, DC really is going back to it's roots in restoring this couple. Paul Levitz knows great comics, and backed by two artists whose reputation is also legion amongst fans, well this book might just float higher then anyone could expect. IN: DIAL H Writer: China Miéville / Artist: Mateus Santoluoco. The first series from novelist China Miéville, Dial H explores what the super-power bestowing device does to the mind of the one who wields it. MY THOUGHTS: I'm in. 'Dial H for Hero' is one of DC's best concepts and I'd buy this book if monkeys were making it. I mean come on, it's regular people granted a power to be so much more, but sometimes turning out much less. What's not to love? Plus Brian Bolland covers! IN: EARTH 2 Writer: James Robinson / Artist: Nicola Scott. The greatest heroes of Earth 2, The Justice Society return! MY THOUGHTS: This will be interesting. The JSA is home to some of DC's most interesting and rich characters, Dr Fate, Spectre and Hourman among them, but who will make this roll call? If anyone can make it so, the writer of JSA: The Golden Age and Nicola Scott can! IN: BATMAN INCORPORATED Writer: Grant Morrison / Artist: Chris Burnham. Morrison, picks up his tale of a Batman global franchise. Can I be Batman Australia? MY THOUGHTS: Grant is a guy no wallet can refuse, especially mine, but what exact Bat to non-Bat ratio is DC looking at for the 52? IN: THE RAVAGERS Writer: Howard Mackie / Artist: Ian Churchill. Four super-powered teens fighting against an organisation wanting to turn them into criminals. MY THOUGHTS: Writer Scott Lobdell knows how to create spin-off-able material. Fresh from his books Teen Titans and Superboy, it's just good seeing Ian Churchill get a high-profile gig again. IN: G.I. COMBAT Core story; The War That Time Forgot (Writer: J.T. Krul / Artist: Ariel Olivetti), plus rotating back-up's; The Unknown Soldier (writers Justin Gray and Jimmy Palmiotti / artist Dan Panosian), and The Haunted Tank (writer John Arcudi / artist Scott Kolins). MY THOUGHTS: DC is definitely set to have a war comic in the mix. While the art teams are strong across the board, I would've made The Unknown Soldier the lead story. 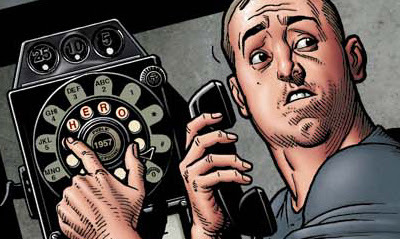 The last Vertigo series of the same name was a third-world masterpiece and should never be forgotten, but I feel Justin and Jimmy will really make something here worth getting fired up over each and every month. What do you think of the new recruits? I'm sad to see OMAC go, but man, am I ever stoked for G.I. Combat! I agree, the Unknown Soldier should be the lead feature, but dang! The creative teams are suh-WEET! BlackEmerald I hear DC even contemplated changing their name to BC comics but apparently those to initals were already in use :D You're bang on though, if this is the way DC maintains its line, the final 52 will be one pretty epic line-up! GA Yeah Im sad to see OMAC go as well, anything that injects that feel of a Kirby book cant really be wrong. Maybe in the next 6, another DC Kirby creation will get it's due, like Mr Miracle or Kamandi! As for G.I. Combat, yip thats looking pretty fine, mind you four outta six are yo mewhich spells bad news for my pull list or grocery budget. (sigh) Who needs food amyway right? Very intrigued by the Earth-2 book; maybe we'll finally see what the hell happened to them during the creation of the NuDC. Same Dale - and I hope Captain Marvel is in the line-up. DC needs him back!